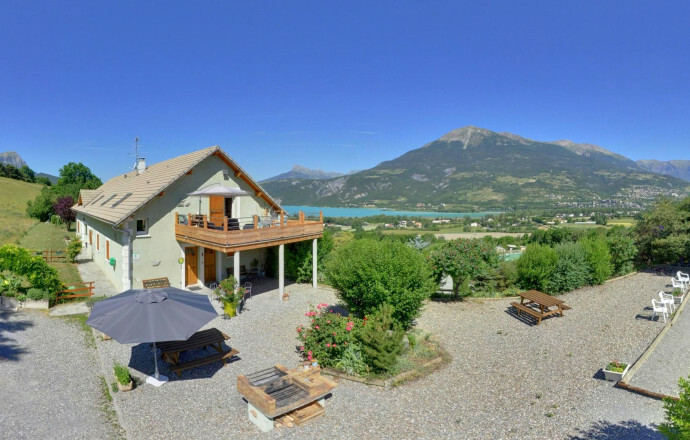 In an exceptional setting, at the gateway to the Serre-Ponçon Lake and near the ski slopes of Les Orres, house on 2 ha land with 2 gites and owners' housing on market garden. Upstairs: independent entrance, the cottage has a furnished outdoor area: children games, garden furniture, barbecue, bowls. Living room, sitting area, terrace 24m2, fireplace, TV, CD player, DVD, equipped kitchen, dishwasher, microwave oven, freezer, 4 bedrooms (2 double beds, 4 single beds). Shower room (2 showers). Toilet. washing machine, local, central heating, mobile phone. Private parking. Ready for baby equipment, (Forfait heating: 60 €. Wood available). Cottage 2km from the town of Embrun. On-site farm discovery free access (ponies, goats, sheep, rabbits, chickens, duck, etc.) showroom agricultural tools of yesteryear, point of sale of farm products and crafts, bar / restaurant with terrace « panoramic view on lake »kitchen elaborated with the products of the farm and local products.